Scandinavia is on the Northern edge of Europe between the Baltic Sea and the Northern Ocean. 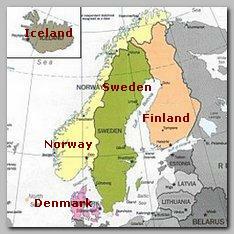 Geographical Scandinavia is composed from four states: FINLAND, SWEDEN, NORWAY and DENMARK. Iceland, which politically is a part of Scandinavia, is located in the middle of the Northern Ocean. All the Scandinavian countries, although are prominent Christian countries, with more then 90% Christian population, have no historical legacy of confronting the Arab or Muslim World and have a liberal and tolerant approach toward other religions, faith and fashions. The countries of Scandinavia were generally not supportive to Israel. The only source of tension between the Scandinavian countries and Islam is the participation of a Danish battalion in the USA led coalition in Iraq and the cultural gape between the liberal attitude of public life in Scandinavia, including the freedom of speech, and the interpretation of the Islamic communities in Scandinavia of these basic values of the Scandinavian political and social culture – the best example is the Muhammad Cartoons crisis in Denmark from 09/2005. Geographical Scandinavia stretches on 1,155,000 km: Denmark 43,000 km, Norway 324,000 km, Sweden 450,000 km and Finland 338,000. The general population of Scandinavia is about 25.3 million people among them 710,000 Muslims, most of them – more then 500,000 – are living in Sweden. Finland has a population of about 5.5 millions, among them more then 30,000 Muslims (0.6%). Sweden has a population of about 9.1 millions including more then 500,000 Muslims (5.5%). Norway has a population of about 5.1 millions with more then 72,000 Muslims (1.6%) and Denmark has a population of about 5.6 millions with more then 110,000 Muslims (2%). Sweden has along tradition from the late 50s’ of providing political refuge to all kinds of asylum seekers from all over the world. Therefore Sweden has, relatively, the highest number of Muslim emigrants. Scandinavia is not only in the margin of Europe but also, so far, in the margin of the Global Jihad.